IN JUDAISM AND CHRISTIANITY, TRUTH IS ONE OF THE CORE ATTRIBUTES OF GOD: “I am the Way, the Truth, and the Life” (John 14:6), and seeking truth is one of the core attributes of a godly person. Sometimes when truth is mentioned in scripture, the writer is talking specifically about spiritual issues. But an overall reading of the Bible makes it clear that honesty and truth-seeking belong to God and the righteous, while obscuring truth is evil, even Satanic. The writer of Isaiah speaks of swearing by the God of truth (Isa. 65:16). In the book of John, Jesus promises that God’s spirit of truth will dwell in his followers. “But when he, the Spirit of truth, comes, he will guide you into all truth” (John 16:13). If Evangelical beliefs are accurate, orthodox Christians are the only people who genuinely worship the God of Truth. Given this, one might imagine that believers would be in a uniquely good position to recognize truths whenever they present themselves. In fact, many Evangelicals make this assumption in a variety of spheres, believing that belief itself obviates the need for specialized training in areas such as diplomacy, public policy, criminal justice, counseling, or teaching. Guided by God’s spirit, a fellow Christian can be trusted to perceive reality and know what needs to be done. The same assumption applies when believers respond to scientific findings. Belief itself is seen as a relevant qualification for making judgments about the accuracy of those findings, and with reason. “He will guide you in all truth.” This promise appears to include truths that are uncovered through the systematic process of inquiry that we call science. A literal reading of the Bible suggests that Christians have within them the very same spirit of God who created and sustains nature. Shouldn’t having the God of nature dwelling in you make nature easy to recognize? Shouldn’t having the God of Truth dwelling in you make truth easier to recognize? In actuality, orthodox Christians as individuals and the church as an institution are often the last to acknowledge what is real in nature and human nature, sometimes fighting to deny new discoveries to the bitter end and beyond. By beyond I mean beyond logic, beyond any reasonable doubt in the scientific community, beyond the wall that separates skepticism from sheer foolishness. Galileo was tried by an ecclesiastical tribunal and spent the last thirty years of his life in virtual house arrest for putting forth such heresy. Yet even at the time he was tried and convicted, the heliocentric (sun-centered) theory was accepted by many astronomers of his day, in other words, by the relevant scientific experts. A book by Copernicus, published in 1543, more than seventy years prior to Galileo’s trial, had opened this door in the scientific community. Although some experts still argued in support of Aristotle’s view that the sun revolved around the earth, evidence was available to suggest otherwise had the church tribunal been in a position to weigh that evidence objectively. Since then, also, the Catholic leadership, has formally apologized for the whole affair. Because it has a central authority and a sense of history, the Catholic hierarchy is capable of learning. In recent years the Church of Rome has been much more humble about taking an authoritative stance on issues of science. In fact, some Catholic scholars have even argued that God permitted the church to make such a humiliating error in order to teach theologians the proper domain of their authority. But Protestants have no centralized authority that can acknowledge the errors and excesses of Christianity’s past. Besides, they often feel those mistakes have nothing to do with their own church or faith. (Those weren’t mistakes of Christians, they were mistakes of Catholics.) In the United States, the Evangelical landscape is dotted by small, home-grown denominations and independent congregations. In keeping with the rest of American culture, there is a bias toward “newer is better,” and Evangelicals tend to rely on recently written books and on-the-spot interpretations of the Bible by their devotional leaders. As stated previously, many Evangelicals don’t know that their core doctrines were largely inherited from Catholics or that Catholics continue to share those beliefs. In fact, many Evangelicals don’t believe that Catholics are Christians at all. One consequence of this ignorance is that very few study church history and vanishingly few have any sense of the battles that have raged between Christian orthodoxy and science. Nor do they know that, in the long run, the church has lost every one. Unfortunately, this means that they are prone still to fight the tide, convinced they will win. The reality is that there are plenty of battles to study, and plenty to be learned from them. They began as soon as Christians switched from being a persecuted minority to an officially sanctioned majority in the Roman Empire. History tells us that in 415 CE in Alexandria, a center of learning and home to the most famous library in the ancient world, a Christian mob seized Hypatia, an Egyptian philosopher and mathematician, dragged her away from her students, dismembered her, and burned her body. Not long after, a fire of questionable origin consumed the famed library, which housed scholarly works of the ancients. So began the Dark Ages. Are you ready for a surprise? White was a co-founder of Cornell University. He wrote his treatise in 1894. And yet, over a century later, several of these conflicts continue. Churchgoers frequently hold wild misconceptions about the methods of inquiry used by scholars and about scientific findings. In this regard, they are much like their secular peers. But for believers, honest ignorance is often matched by dogmatic denial. Literalists ignore or distort discoveries that contradict the literal words of the Bible. They may fight to prevent the dissemination of scientific findings that they see as a threat to faith. They may refuse to implement technologies or policies that they see as challenges to Bible-based morality. With the rise of Evangelicalism in the United States, these battles have only intensified. One dramatic example is the controversy that surrounds evolutionary theory, which threatens the notion of a literal six-day creation sequence. In common, everyday speech, a theory is simply a hunch or a hypothesis. By contrast, in science, a theory is the structure of logic that integrates a series of data points into a unified whole. It takes the data and extracts a theme or pattern. A good theory explains why the findings are as they are, predicts what we can expect to find with further research or exploration, and links the data in question to other scientific findings. Misunderstanding this difference, many American Evangelicals have dug themselves in to fight against the theory of evolution, not understanding that they might as well be fighting the theory of gravity. Since Darwin’s time, the evidence for natural selection has become overwhelming. Gaps in the fossil record become smaller with each additional discovery. The process of selection has been observed in nature. Computers have been programmed to model different selective pressures and rates of mutation. Natural selection has been observed under laboratory conditions, and has been shown to function in areas outside of biology, as in the spread of information. DNA sequencing now allows geneticists to assess closeness of relationship between different species just as they would with human families. The guesswork is gone. In fact, genetic engineers are at the point of creating new species themselves by applying their knowledge of how change happens in the natural world. And yet young earth creationists continue to insist that dinosaurs coexisted with humans and that the world was created 6,000 to 20,000 years ago. The Seattle-based Discovery Institute promotes “intelligent design,” with the expressed goal of opening the door to biblical creationism. In some school districts, teachers have been forbidden to discuss origins of biodiversity. Textbooks in Georgia were labeled with warning stickers stating that the theory of evolution is “only a theory,” meaning just one possible hypothesis among many. The fact is, there are no scientifically plausible alternatives. Teaching anything other than evolution to explain biodiversity is teaching religion. It requires that one deny not only findings in, but the very methods of, scientific endeavors as diverse as anthropology, genetics, biology, geology, physics, medicine, pharmaceuticals, and computer science. Animosity toward evolution science does damage that stretches far beyond questions about biology. When creationist leaders publicly scorn any scientific methodology that supports natural selection, they feed public mistrust of scholarship in general. Some devout believers avoid educational programming or popular science magazines such as Scientific American or National Geographic that assume the earth is ancient and species have evolved. Some even avoid science in general, and scientific education for their children. Such avoidance fosters ignorance and misinformation. For example, it opens the door to unproven medical treatments, while creating wariness about well-researched medical practices. Neurology and psychiatry are viewed with particular mistrust. They are seen as infringing the domain of theology and morality, with the result that many Evangelicals don’t support mental health treatment services in their communities. They may resist psycho-active medications for themselves or family members unless extreme psychosis forces treatment. In the United States, as in other countries, scientific panels consult on issues ranging from energy policy to prescription drug approval. As boundaries between church and state have blurred and as Evangelicals have gained political influence, appointments to these panels are based increasingly on ideology rather than on scientific qualifications. And more and more, the panels produce recommendations that are explicitly opposed by experts in the relevant fields of inquiry. As a consequence, a wide range of public policy debates become tussles between competing ideological opinions, even when data suggest a specific course of action. How is it that those who call themselves servants of truth: “you will know the truth and the truth will set you free” (John 8:32), have spent literally millennia fearing it, opposing it, and having to be dragged into the light? I’ll grant that once they are dragged, kicking, and screaming, and sometimes committing more lethal acts of aggression along the way, they often settle down and reconcile their faith quite comfortably with realities such as the lack of a literal firmament above the sky or a heliocentric universe or a biological explanation for seizures. The point is, this pattern is endemic to orthodox Christianity. It is not the exception; it is the rule. It has historical consistency, consistency across subject matter, and consistency across the cultures that have widely accepted orthodox faith. The European Dark Ages have been attributed in part to the fact that orthodox world views displaced earlier modes of thought that were more open to naturalistic explanations of the natural world. For centuries inquiry was actively suppressed. Folk medicines were labeled witchcraft and their practitioners killed. Scientists presented new findings and proposed new theories at their own risk, as the case of Galileo demonstrates. In the New World, the Puritan leaders planted themselves squarely in opposition to the evolution of human knowledge, and Christian soldiers marched forward, resisting new findings as these emerged. They do the same today. Do not let kindness and truth leave you, says the Psalmist (Prov. 3:3). A righteous man hates falsehood (Prov. 13:5). Time and again, we are told that the wicked resist truth, that they turn away from it, while veracity, including honest self awareness, pleases God (2 Tim. 3:8, 4:4; Psa. 51:6). With such an explicit mandate to pursue truth, devout believers should be predisposed to embrace truth wherever it presents itself. One might expect that resistance would be the exception, attributable to individual hard-heartedness or soft-headedness, or to transient infiltration by the Father of Lies. And yet, given the intellectual walls imposed by unquestionable doctrines and biblical literalism, is it any surprise that history suggests otherwise? What would it mean to fear falsehood more than questions and to behave as if all truth really is God’s truth? 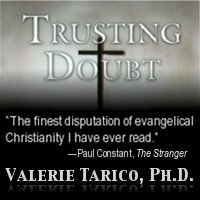 Gallery | This entry was posted in Trusting Doubt: Individual Chapters and tagged Christian fundamentalism, recovery from religion. Bookmark the permalink. Isn’t God in its entire known existence that of positive energetic truthhood..alas this must be Love, in an unconditional sense! So falsehood is the opposite or negative Hate. Behaving in a nature v. nurture mold is in itself evolution at its core, thus the whole scientific v. faith based philosophies of the East/West are one in the same….Positive Energy! So Deliver us from Evil and forgive us our Trespasses as we forgive those who Trespass against Us…that is positive forgiveness by the individual person. Look at the leadership in the torn up, death towns in parts of Africa…they forgive and love the very people that murdered and raped their children and families…so again, an Idol is fine if in a positive mold, unfortunately we, as a society did not intergrate because of an ignorant way of behaving through idustrialization.